It’s often difficult to discern in the archaeological record wild boar remains from those of domestic pigs. Luckily archaeogenetics can solve the problem, sometimes producing striking results. Mesolithic populations throughout Europe used diverse resource exploitation strategies that focused heavily on collecting and hunting wild prey. Between 5500 and 4200 cal BC, agriculturalists migrated into northwestern Europe bringing a suite of Neolithic technologies including domesticated animals. Here we investigate to what extent Mesolithic Ertebølle communities in northern Germany had access to domestic pigs, possibly through contact with neighbouring Neolithic agricultural groups. We employ a multidisciplinary approach, applying sequencing of ancient mitochondrial and nuclear DNA (coat colour-coding gene MC1R) as well as traditional and geometric morphometric (molar size and shape) analyses in Sus specimens from 17 Neolithic and Ertebølle sites. Our data from 63 ancient pig specimens show that Ertebølle hunter-gatherers acquired domestic pigs of varying size and coat colour that had both Near Eastern and European mitochondrial DNA ancestry. Our results also reveal that domestic pigs were present in the region ~500 years earlier than previously demonstrated. The most striking result is surely not the demonstration of pigs being in Central Europe a few centuries than previously confirmed but that Ertebølle hunter-gatherers of Denmark had them as well, quite radically casting doubt on their status as hunter-gatherers and placing them fully in the Neolithic context, even still rather marginal and peripheral. Figure 1: Map depicting the location of the archaeological Sus samples from which mtDNA haplotypes were obtained. Samples were recovered from Neolithic LBK, post-LBK and Mesolithic Ertebølle sites dated between 5500 and 4000 cal BC. Each symbol corresponds to a single sample (triangle, square and circle). Domestic (triangle) and wild (square) pigs discussed in the text are labelled; circles represent Sus specimens of unknown domestication status. The red colour indicates the European haplotypes C and A, and yellow the Near Eastern haplotypes Y1 and Y2. For some a religious taboo but for most a staple food, pigs have been in our farms and kitchens for many millennia now. It has been known for long that pigs are just the domestic variety of the Eurasian boar (Sus scrofa) but which populations specifically has been a matter of some debate. Now we know that East Asian pigs were domesticated locally (see appendix) but in the West it was found recently that European pigs have European boar lineages, while West Asian pigs in many cases do not. Previous studies determined that early European pigs were of West Asian ancestry but that by c. 4000 BCE all lineages were local. This new study explores lineage diversity in ancient West Asian pigs from Anatolia, Kurdistan, Armenia, Georgia and Iran. Zooarcheological evidence suggests that pigs were domesticated in Southwest Asia ∼8,500 BC. They then spread across the Middle and Near East and westward into Europe alongside early agriculturalists. European pigs were either domesticated independently or appeared so as a result of admixture between introduced pigs and European wild boar. These pigs not only replaced those with Near Eastern signatures in Europe, they subsequently also replaced indigenous domestic pigs in the Near East. The specific details of these processes, however, remainturnover in the Near East, we analyzed ancient mitochondrial DNA and dental geometric morphometric variation in 393 ancient pig specimens representing 48 archeological sites (from the Pre-Pottery Neolithic to the Medieval period) from Armenia, Cyprus, Georgia, Iran, Syria and Turkey. Our results firstly reveal the genetic signature of early domestic pigs in Eastern Turkey. We also demonstrate that these early pigs differed genetically from those in western Anatolia that were introduced to Europe during the Neolithic expansion. In addition, we present a significantly more refined chronology for the introduction of European domestic pigs into Asia Minor that took place during the Bronze Age, nearly 1,000 years earlier than previously detected. By the 5th century AD, European signatures completely replaced the endemic lineages possibly coinciding with the demographic and societal changes during the Anatolian Bronze and Iron Ages. Fig. 1. 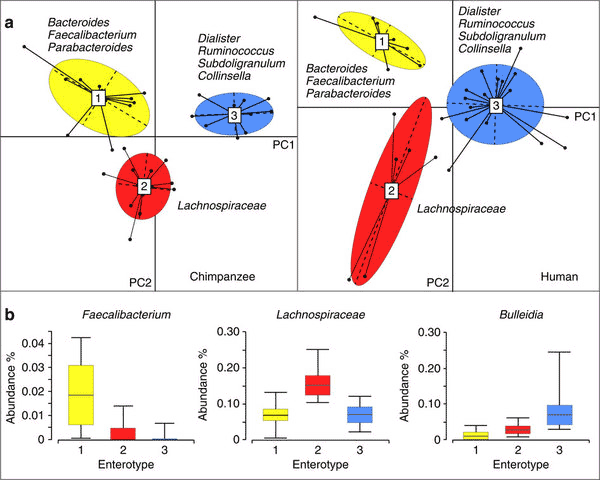 A spatiotemporal depiction of ancient pig haplotypes. Rows represent eight chronological periods and columns pertain to sites organized along a longitudinal axis from west to east. Approximate locations of the archeological sites from which the samples are derived are shown as numbered circles on maps beneath the horizontal axis. Asterisks indicate directly AMS-dated samples. The question mark signifies not enough material was available for AMS dating. Slashed boxes indicate samples on which GMM analyses were performed. 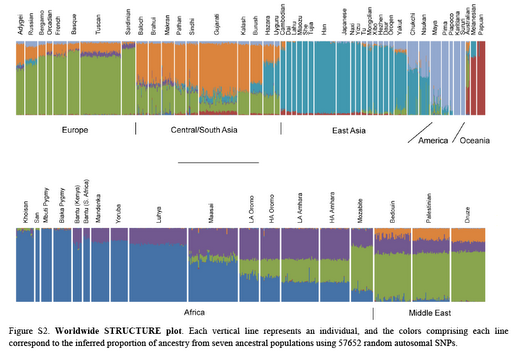 Pie charts to the right of each row summarize the haplotype frequencies for each chronological period across all sites. Columns pertain to one or two sites except for two columns that consist of several sites: Armenia (Sevkar-4, Areni-1, Khatunarkh, Shengevit, Lchashen, Tmbatir, Pilorpat, Beniamin, Tsakaektsi) and Iran (Qaleh Rostam, Qare Doyub, Qelīch Qōīneq, Dasht Qal’eh, Doshan Tepe, Malyan, Mehr Ali, Chogha Gavaneh and Gohar Tepe). 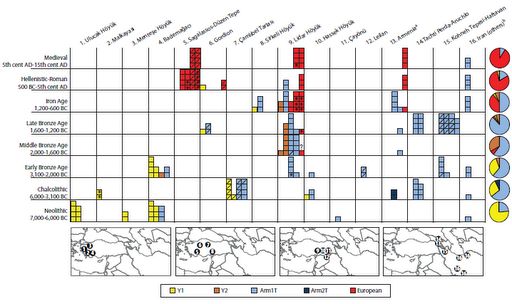 All shown West Asian lineages (Y1, Y2, Arm1T and Arm2T) belong to the NE2 clade, a related NE1 clade (common in Southern Iran, Iraq and Egypt, as well as Georgia) was not detected. See fig. 2 for details. Early European domestic pigs all belonged to the Y1 haplotype, later replaced by the European ones, as mentioned above. Larson 2009 (freely accessible), also review at Science Daily. Shuli Yang 2010 (Tibet, open access). Giuffra 2000 (direct PDF link).